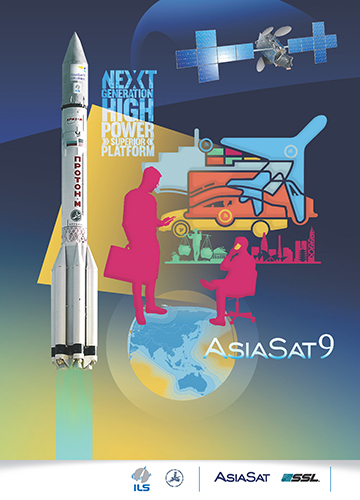 Purpose: AsiaSat 9 is AsiaSat’s most powerful satellite designed with enhanced performance, higher efficiency and greater flexibility for DTH, video distribution, VSAT broadband and mobility services. AsiaSat 9 is a replacement satellite for AsiaSat 4 at 122°E with 28 C-band and 32 Ku-band transponders, and a regional Ka-band payload. It carries the world’s first dedicated Ku-band Myanmar beam, new Ku-band beams for Indonesia and Mongolia, in addition to two enhanced Ku-band beams serving Australasia and East Asia and a wider high-power C-band coverage across the Asia-Pacific region. The five Ku‑band beams onboard AsiaSat 9 are equipped with cross-strap beam switching capability to provide flexible coverage.